The White Glass Boardroom Table is all about the glass! Pristine lines top of the line built to order with full IT power and data managmented smartly with in the table. Total clean lines with no wires showing makes the best impression. The glass shown is a white back painted true clear glass. An alternative upgrade is the stain glass. Satin glass cuts down on the glare if your table is in a room with a lot of light an windows. The satin glass also conceals finger prints. Other glass colors offered. 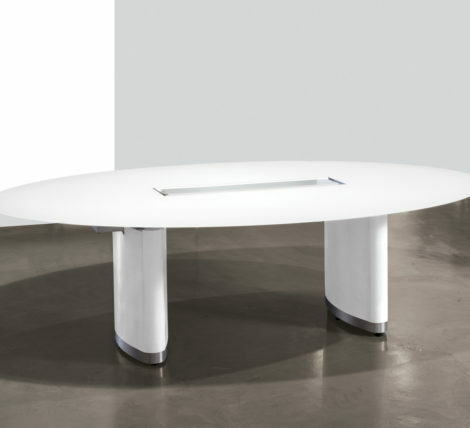 The White Glass Boardroom Table is a boat shaped table with panel base leg. A hefty wire management trough hoses all the wires under the table. The White Glass Boardroom Table is offered in rectangular, boat and elliptical shapes. The White Glass Boardroom Table is a perfect shape for sight line vision– everyone sitting around the table has a straight unobstructed view of the heads of the table. Back painted and satin glass are at the very high end due to the cost of the premium glass. If you are on a tight budget and want a white table consider white matte laminate as great way to go for a durable surface. We don’t recommend glossy white laminates for a writing surface as it scratches easily. We have all levels of power and data to add per your IT requirements. That’s it. We’ll help you with your selection of materials. We’ll get it quoted out give us a a day or two for accurate pricing. You may want to stick with a standard table size which run 96″ x 36″ or x 48″, 120″ x 48″, 144″ x 48″ on up to 25′. Lead-times for custom built tables range from a standard 8 week lead-time to 10-12 weeks. It all depends on the project. Contact Mar to discuss custom options to meet your needs. 310 213-9551. mar@ambiencedore.com. Be sure we have your full contact information for serious quotes or hit the quote request button up top.